The first ever full-length biography of Lonnie, without whom, no skiffle, no Quarrymen, no Beatles… is out now! As well as providing a unique picture of the British popular music scene against which The Beatles grew up, the author also obtained interviews with Paul McCartney and Ringo Starr who talked exclusively about their skiffle roots. And as if that wasn't enough… the book contains a previously unpublished photo of Lonnie with the three surviving Beatles! BBFC Members, John and Rose recently got in touch with us to share their memories of 1962. It's always fabulous to hear the stories from the people who were there! Thanks, John and Rose, for allowing us to share your memories on the website! "We were members of the Cavern Club in 1962 and always went when the Beatles were on (3/6 to get in). They told us that they were going to make a record called Love Me Do, and asked us all to buy it. I ordered it from a market record stall and as the market was on a Thursday they got it for me the day before it was officially released being the Friday, so I have always hoped that I had the very first record of the Beatles to be sold. I will never part with it of course. We will never forget the magical Cavern and the wonderful groups who appeared, the Beatles were always the most popular. The girls who sat on the chairs in front of the stage uses to go wild. We used to sit in an alcove on the right of the stage. I remember that the sweat used to pour down John's face when he belted out "Twist and Shout". We used to have a Coke with them at the little bar at the back of the Club. Good times gone forever but "We were there!" Liverpool's favourite tribute band, the Mersey Beatles, return to Sweden tomorrow for a five-night tour. Steven Howard, who plays 'Paul' in the band, told the BBFC, "we have a very loyal fan base in Sweden and it's always great to 'get back' to see everyone there." The Mersey Beatles stepped down from their position as the Cavern's resident Beatles Tribute band in February after ten years because of the increasing demands for overseas tours and concerts elsewhere in the UK. In the past two weeks, they have performed at the Red Rock resort in Las Vegas and played to enthusiastic and sell-out crowds around Ireland. Tune into Look North at 6.30pm on Monday (or view it later on iplayer if you're in a different region) for a look at this fabulous exhibition that opens this weekend at the Wensleydale Gallery in Leyburn! There will be a preview of some of the photos on display, and an interview with the photographer Paul Berriff. Works illustrating the Life and Work of George will be on display for two weeks. AND YOU ARE INVITED TO BE PART OF THIS SPECIAL EVENT! No matter where you live in the world you can participate! 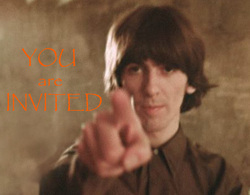 If you write your name clearly we will post all your names on Facebook and on the "For George" website. The Mersey Beatles are coming to Ireland….at last! Only a few tickets are left for each of the shows so get yours now to avoid disappointment! The boys will perform their all era Beatles concert in full costume. “Love Me Do” to “Let It Be” via “Pepperland”. Having headlined tours and festivals in over 20 countries worldwide, it’s surprising to hear that this will be their first visit to Ireland. Book your “TICKET TO RIDE” and “GET BACK” through the mists of time on a “MAGICAL MYSTERY TOUR” with THE MERSEY BEATLES. Sunday 21st October sees the London Beatles Day celebrate 50 years since the release of Love Me Do, the LONDON BEATLES DAY will take place at a brand new venue for us the THE SHERLOCK HOLMES HOTEL 108 Baker Street, London, W1U 6LJ - which is yards from the former Apple boutique, and 2 minutes walk from Baker Street station. We are very pleased to welcome HUNTER DAVIES - who will be selling & signing his great new book THE JOHN LENNON LETTERS from 11am to 12 noon. We are also pleased to have along for the day Authors Kevin Roach - who sill be signing/selling his new book about George's family and Gail Renard who will be selling/signing her book - Give me a chance - which is a great insight into John & Yoko's 1969 bed in from a lady who was actually there! ... finally the TREMBLING WILBURYS will be calling by between 1pm - 2pm for a chat & promoting their concert later in the day at 'The Castle Rocks' (452 Finchley Road, London, NW11 8DG) watch out for Glenn Knowler (TREMBLING WILBURY George) at the Sherlock Holmes hotel he is the living image of George Harrison - you must see him to believe it ! As always come and have a chat with Fellow Beatles fans - Always a great day out with like minded Beatles people..
A "Love Me Do" Marathon of Celebrations for Liverpool's Mersey Beatles! The Mersey Beatles will celebrate 50 years of the release of The Beatles first single this Friday and Saturday. A "Love Me Do marathon" of events starts for them at 11am on Friday when the boys will be live on BBC Radio Humberside via link up to BBC studios in Liverpool. Between 2pm and 5pm The Mersey Beatles will perform live on Radio Merseyside. as requested by host Billy Butler. Later they play in Formby at the St John Stone venue. Unfortunately for fans all 250 seats have been sold out for weeks. On Saturday The Mersey Beatles will be at Grimsby Central Hall to perform their all era concert including back projection, four costumes and around 40 of your favourite Beatles songs 100% live and in the original recorded key. A few tickets for this special event are still available; click HERE for more information and to book. On Sunday, BBC4 will air an one-hour documentary, “Love Me Do: The Beatles ‘62”, in which Stuart Maconie explores the story behind the Beatles first single, and how it went on to change music history and popular culture forever. Guest-starring The Mersey Beatles, and featuring reflections from pop artist Sir Peter Blake, Bob Harris and former Beatles drummer Pete Best, this is not to be missed! Then it's all down to London in time to celebrate John Lennon’s birthday by playing a sold out dinner concert on the Thames aboard the all-glass symphony boat. 100 very lucky guests will enjoy this special evening. This weekend Liverpool will lead the way with a series of special events celebrating the 50th anniversary of the release of Love Me Do! The celebrations begin at the Princes Dock, where thousands are expected to gather in a World Record breaking attempt, singing Love Me Do. Organised by the City of Liverpool in conjunction with the award-winning Beatles Story attraction, this unmissable experience is set to take place at The Cruise Liner Terminal, Princes Dock, Liverpool. But the World Record Attempt is just the first event in a day of celebrations! There will be a fantastic showcase of live music at Albert Dock all weekend! Between 12pm and 5pm bands and choirs will be performing in Anchor Courtyard, with even more live music at venues including PanAm and Circo. Don’t miss the special night-time projection on the Docks walls too! Meanwhile, the world's most famous club, the Cavern Club, will mark the anniversary with special shows throughout the day. From 2pm, the Cavern's resident bands, including the Beatelles, Liverpool's fabulous all-girl Beatles tribute band, will perform on the iconic front stage with FREE entry before 8pm (£3 thereafter). Then, from 8.30, the Cavern's resident Beatle Band, The Cavern Club Beatles, will take to the stage for a theatre-style celebration in the Cavern's Live Lounge. Tickets are £12 and are available HERE! If you can't make it to Liverpool, don't worry! Liverpool's favourite tribute band, the Mersey Beatles are performing special celebration concerts on Friday night at the St John Stone theatre, near Southport (completely sold out), and at the beautiful Grimsby Central Hall on Saturday -- a few tickets are still available; click HERE for more information and to book.